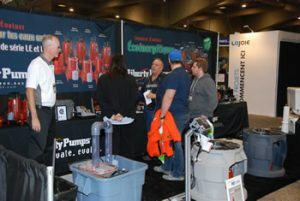 Visitors check out the Liberty Pumps booth at the 2017 MCEE trades show in Montreal. The industry spotlight will be on Montreal this month as the MCEE trade show returns to Place Bonaventure April 24-25. Visitors can expect to see a full range of new products including, heating, refrigeration, air conditioning, plumbing, hydronic heating, tools, software, trucks and accessories, backflow, and electrical. Organizers have announced the list of finalists for this years New Product Competition. Each product will be judged by a panel of experts and the winners will be announced at a special ceremony just prior to the show. MCEE opens at 10 a.m. on April 24. In addition to over 400 exhibitors, there will also be 22 free seminars over the two-days covering topics in plumbing, hydronics, HVAC/R, electrical and lighting. All will be presented in French. Visitor registration is free until April 23. Show hours are April 24 from 10 a.m. to 7 p.m. and April 25 from 10 a.m. until 4 p.m.
MCEE (Mecanex, Climatex, Expoelectriq, Eclairage) is produced by the Corporation of Master Pipe Mechanics of Quebec (CMMTQ), the Canadian Institute of Plumbing and Heating (CIPH), the Corporation of Master Electricians of Quebec (CMEQ), and the Corporation des entreprises en traitement de l’air et du froid (CETAF). Please visit www.mcee.ca for more information.